Are Germicidal Lights Right for Your Home? When you live somewhere like Lawrenceville, there’s a good chance that you already think about your air conditioner quite a bit. You’d understandably like to expect that it works efficiently and effectively throughout its lifespan. But what many homeowners don’t think about when it comes to their HVAC system is the “V” part of the equation—the ventilation that connects your cooling system to the outside, making the distribution of cooled air possible. This ventilation system, known as your ductwork, is usually out of sight—hidden behind walls, beneath floors, or in your attic or crawlspace. Unfortunately, if your ductwork was installed by an inexperienced ‘professional,’ then there is a good chance that it has accumulated damage over the years. And if your air ducts are negatively impacted by anything like air leaks or poor connections, you could be experiencing problems that lead to poor HVAC efficiency and possible even AC repair needs. This isn’t something you might hear HVAC technicians talk about a lot, because if you’ve hired a good company this is a lot less likely to happen, but it’s possible that your ductwork was not properly sized during installation. If this is the case, you may notice right away after your new air conditioner starts running that it’s making noises due to low airflow or some other problem. Unfortunately, too many homeowners hear noise and assume it’s just a noisy system and there’s nothing they can do about it. But this attitude will eventually result in uneven temperatures throughout your living space, since conditioned air won’t be reaching all of your vents. Studies have shown that poor ductwork design and/or installation can lead to as much as 60% air loss, for much lower efficiency. Not only does this put a strain on your wallet, but it’s not good news for your HVAC system either, since that system will struggle to reach the desired temperature that’s been set for it, and as a result the system will start degrading and age rapidly. You’ll find yourself calling more and more for repairs, for things like motors and fan belts breaking down, or compressor issue. You could even find yourself facing a premature AC replacement. 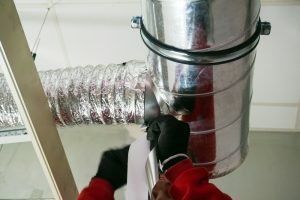 Whether your ductwork isn’t properly sized or they have bad connections, poorly installed ductwork might not be connected the right way, and therefore can experience air leaks. If this happens, you’ll notice a reduction in cooling power for your air conditioner as a result, in addition to reduced heating power from your heater. Another problem that can impact any aging air ducts, no matter how professionally they were installed, is if they were installed in a hot attic without adequate protection from the elements. Your roof is actually not a great insulator, and as a result your air ducts can accumulate pinhole leaks, thus wasting your conditioned air. For quality duct services and air conditioning repair in Lawrenceville, GA, contact Wall Heating & Air Conditioning, Inc.